Já neste blogue se tinha escrito que a recandidatura de Barack Obama iria ser oficializada em Abril. A confirmação deverá acontecer já esta segunda-feira, dia 4, numa altura relativamente positiva para o Presidente: os números do desemprego continuam a descer na América (estão nos 8.8%, o valor mais baixo dos últimos dois anos) e, do lado republicano, a corrida para as primárias tarda em arrancar, perante a falta de um claro 'frontrunner'). Na frente externa, a questão líbia está longe de ficar clarificada, mas os indicadores junto da opinião pública norte-americana apontam para um apoio moderado dos eleitores à posição da Administração Obama. Com uma Taxa de Aprovação a rondar os 52%, esta parece, pois, ser a altura certa para Barack Obama avançar para mais uma longa corrida: a da candidatura a um segundo mandato presidencial. «President Barack Obama will officially open his 2012 re-election campaign as early as Monday, according to people familiar with the decision, a step to be followed by an announcement to supporters and a series of fund-raising trips across the country. 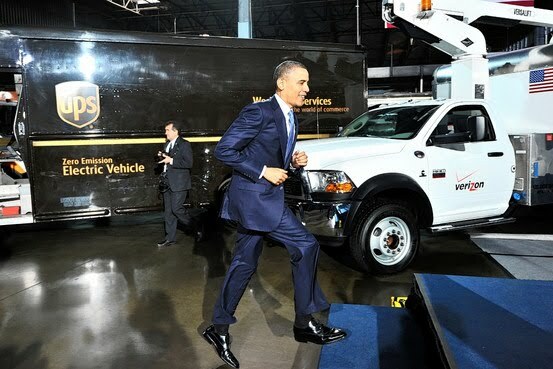 President Obama spoke at a UPS facility in Landover, Md., on Friday. .The president would be launching his campaign amid high-stakes budget negotiations in Congress from which Mr. Obama has maintained a distance, and could fuel irritation among some Democrats worried that Mr. Obama has already been crafting positions and a strategy with 2012 in mind. Mr. Obama plans to hit the road this month to raise money for his re-election effort. He will headline a fund-raiser in his hometown of Chicago, home to his campaign headquarters, over the next two weeks. He will also raise money in New York and make a swing out West, mixing stops for presidential events highlighting the economy and fund-raising in San Francisco and Los Angeles. The fund-raisers are billed as benefiting the Democratic National Committee, but once Mr. Obama formally opens his campaign, the money can be split between his 2012 bid and the DNC. The president's political team has plans for "Gen44" events with young voters who were central to Mr. Obama's 2008 win. Mr. Obama's campaign is expected to file paperwork Monday with the Federal Election Commission, people familiar with the process said, although the date could slip. The decision will open the doors for fund-raising that could lead to the most expensive campaign in history. The president's campaign manager, Jim Messina, has been warming up big-money donors. During a meeting in Washington, D.C., last month, he asked 450 donors to raise $350,000 each by the end of 2011. If he files with the FEC on Monday, Mr. Obama would be the lone 2012 candidate to formally declare. He isn't expected to face a primary challenge. No Republican contender has formally launched a campaign, though former Minnesota Gov. Tim Pawlenty recently established an exploratory committee and former Massachusetts Gov. Mitt Romney—who went on a 15-city push to secure money—is among several Republicans who have been raising funds. Republicans sought to take advantage of what they saw as a president swinging into campaign mode: "I'm somewhat amazed that at a time when millions of Americans continue to be out of work, we're facing multiple crises and we're trying to get a deal to keep the government operating, the president has spent more time on figuring out his re-election campaign than he has in addressing the both domestic and international issues," said Sean Spicer, the communications director for the Republican National Committee. A spokesman for the Democratic National Committee declined to comment Friday. The president's advisers have said that the start of a campaign wouldn't mean Mr. Obama would be consumed with campaigning and that it is typical for sitting presidents to begin their re-election efforts around this time. The White House envisions the re-election campaign will be relatively quiet until next spring, when Republicans have settled on a candidate. Mr. Obama's job approval fell to 48% in the most recent Wall Street Journal/NBC News poll from 53% in February, but it was still higher than at any time since last May. Ever since Mr. Obama cut a tax deal with Republicans last fall, some Democrats have complained that the president moved to the middle and gave too easily into Republican demands. Mr. Obama has also irked some in his party with an effort to return to his post-partisan rhetoric of 2008. The move is partly an adjustment to the new political reality in Washington, but also a calculated move on the president's part to win over independent voters. Mr. Obama acknowledged the sentiment during an event with Democratic donors last month.